I’ve been spending a lot of time, recently, playing through Rockstar’s new game Red Dead Redemption. I didn’t mean to. I bought it on a whim, always having had an affinity towards American History and that particular time period, but didn’t really think I’d ever get into it until I had a week or so to myself. But, on a random night with really nothing else of interest, I popped the disc in, and have dedicated my mental capacities to playing the game, or thinking about playing the game for the past 2 weeks. It’s dug its spurs deep into me, and I don’t see the game pulling back the reins any time soon. 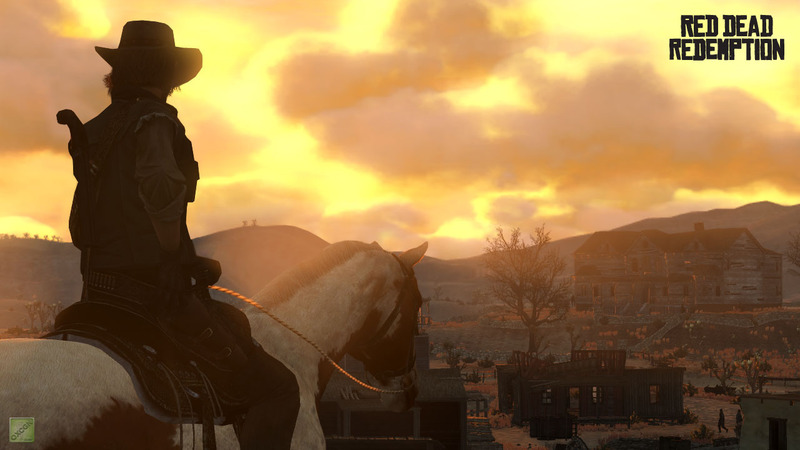 What strikes me the most about Red Dead Redemption really isn’t its gameplay — it’s your standard GTA-style fare with 3rd person shooting, sandbox exploration, and morality choices. What I’ve been drawn to the most is the social commentary, which this time not about authority corruption and urban survivors as their past outings. Red Dead Redemption carries a sufficient amount of more weight on its back. It acts as a gritty encyclopedia for a time that has always been glorified and romanticized. We tend to forget that the late 1800’s saw the near genocide of an entire population, the forceful claiming of a multi-century civilization’s sacred land, and the utter lawlessness (even from those behind the badge) of a land that saw women and children die just as easily as a (fill in the blank) Beard Outlaw. Your character is a former outlaw with a wife and child trying to rid himself of his past. To do this, he must redeem himself by helping out a small ranch try to establish the American dream. Along the way you can hunt (more on that in a minute), collect bounties, intervene (or not) in spousal abuse/raids/train robbing/kidnapping/more, and just explore the countryside. The beauty of America is on full display here, and Rockstar deserves some sort of non-gaming award for their amazing replication of what mid-west America was like before we stabbed it with our power lines and skyscrapers. There are times where I suddenly realize that I’ve done nothing but ride my horse around the chaparral for almost an hour, accomplishing nothing but soaking in the beauty of this country. Then, there is the dense collection of history. You can hunt and shoot all sorts of animals, ranging from deer to coyotes, crows to eagles. You can even hunt buffalo, and this is where Rockstar flexes their ironic muscles. We know the fate of the buffalo in this country, and we know what we did to this species in order to drive the Native Americans off of their glorious lands in the hopes of taking what wasn’t ours. And yet, you can still choose to hunt buffalo in this virtual world where they may have stood a chance. If you do, then you will have completed the “Manifest Destiny” quest, a humbling and very appropriate name for what might be (and probably is) considered an immoral choice in the game. Immoral choices are constantly there for the taking. Should you rescue the woman who has been stolen from her family and return her to safety? Or, should you rescue her, and then sell her off yourself? Should you let the prostitute continue to be beaten on the steps of the Saloon, or should you shoot her assailant (after all, it’s not your fight for the picking)? Should you help out the stagecoach that is being robbed? And, once you’ve dispatched the outlaws, should you then take the prize for yourself, or let the victims go? It may sound like a mindless mix of “Do good?” or “Do bad?” But, in this setting, more so than ever, you are left completely to your own choices. In GTAIV, it was hard to “do bad,” because you knew that police would eventually come for you, and that just in general, you were violating steadfast, well established laws of behavior; however, in Red Dead Redemption’s western, 1880’s setting, the laws that guide you are your own, and that choice has never been more historically appropriate than it is here.